It is finally spring! Not that winter on the Gold Coast is really that terrible but it already feels warmer and brighter outside. It’s that time of year to open windows and have long lunches and barbeques with friends. 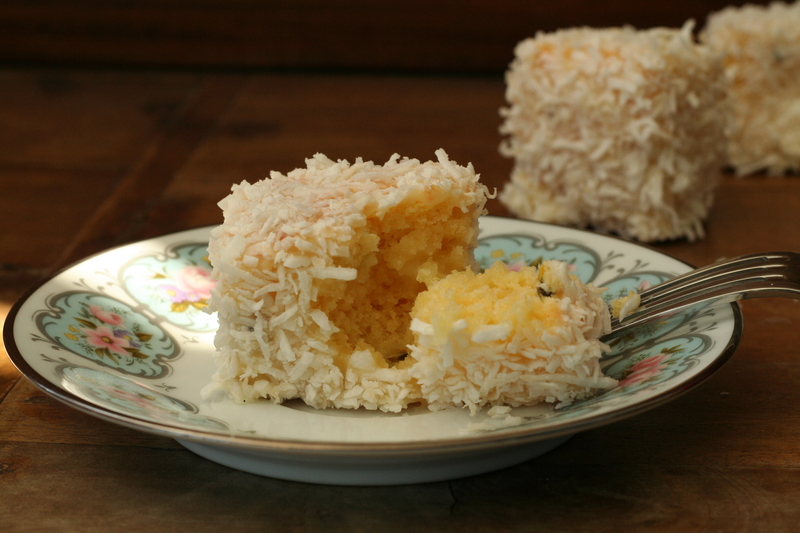 Which is where these lamingtons come in. 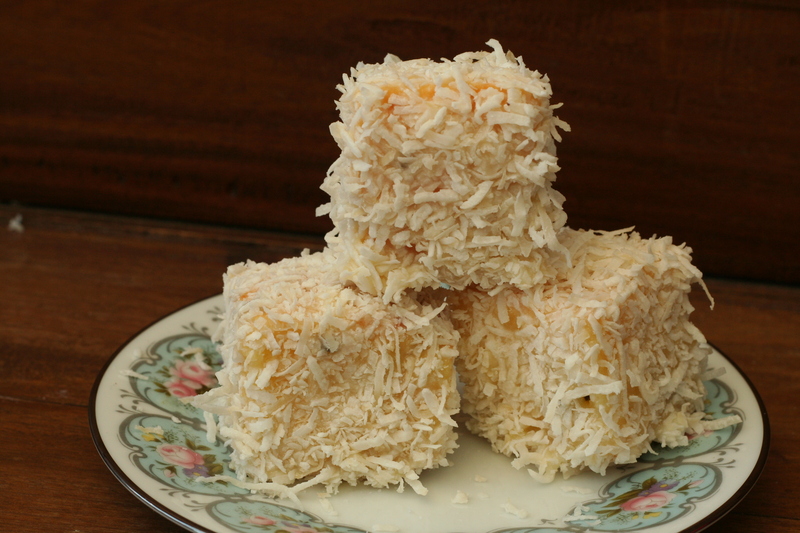 Perfect for picnics or lazy get-togethers in the sun they’re a variation on the traditional Aussie lamington. Instead of dark chocolate and jam these miniature cakes use white chocolate and passionfruit to make them light and tangy. You can choose to fill them or skip this step but the extra hit of white chocolate is quite delicious. If you wanted to be more technical you could slice them in half and fill them to make a sandwich but I find this technique much easier. 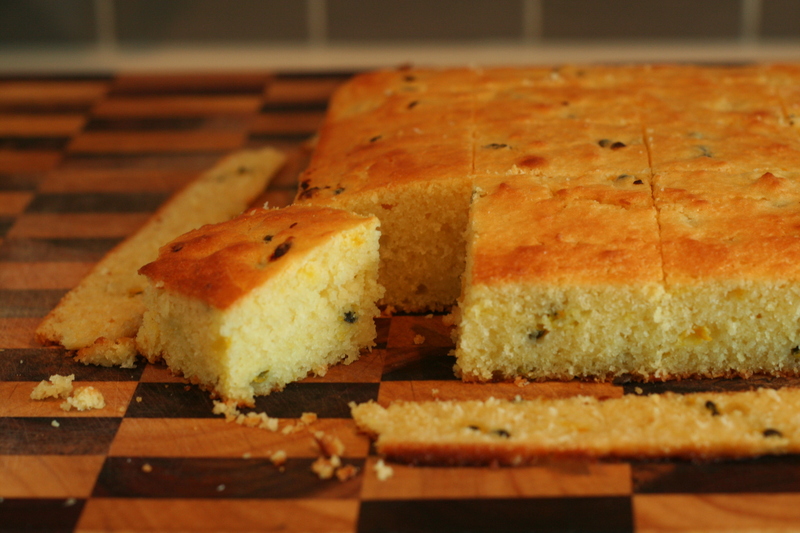 For those who hate passionfruit seeds in their cakes you can sieve them out but personally that seems like too much effort and I do quite like the crunch you get when you bite into them. It is also Fathers Day here in Australia and although my dad lives interstate he has been on my mind all morning. I think he’d really enjoy these and hopefully I’ll get to visit and make them for him soon. It’s often hard sometimes to tell your parents just how much they mean to you and how grateful you are for what they’ve done. My dad has always been there for me and I know if I am ever in trouble I could call at any time. While we may not talk much I am often told how much I take after him, and I know that it is from him that I get my love of books and interest in science and medicine. So for that (and many other reasons) I just want to say Happy Fathers Day dad, I love you. I also have to mention my wonderful father-in-law. Since taking me into their home 9 years ago when they barely knew me, my in-laws have been fantastic. My father-in-law is a patient and very caring man who has taught me a lot. I am really lucky to have both of these great men in my life. Preheat your oven to 180° and line a 19cm square tin with baking paper. Beat the butter and sugar on medium speed until light and fluffy. Add the eggs one at a time and the vanilla and mix to combine. In one small bowl combine the coconut and flour and in another combine the sour cream and passionfruit. Alternatively fold ½ of each mixture into the batter then repeat with the remaining mixture. Continue to fold until just combined. Pour into prepared pan and smooth over the top. Bake for 20-25 minutes or until a skewer inserted into the centre comes out clean. Allow to cool completely before cutting the edges away and cutting into 16 squares. I found using a serrated bread knife the easiest way to do this. 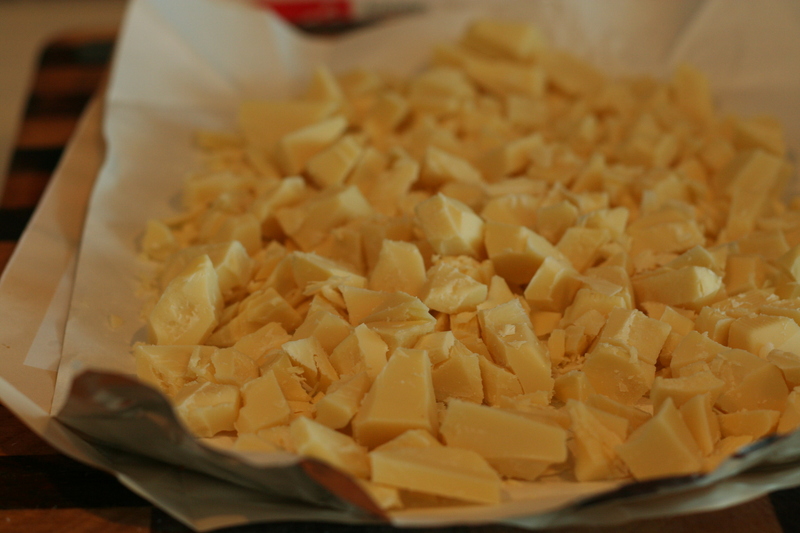 While cooling prepare the white chocolate mixture. Heat the milk in a saucepan over low heat until just boiling. Turn off the heat and add the white chocolate. Allow to stand for a couple of minutes then whisk together until smooth. 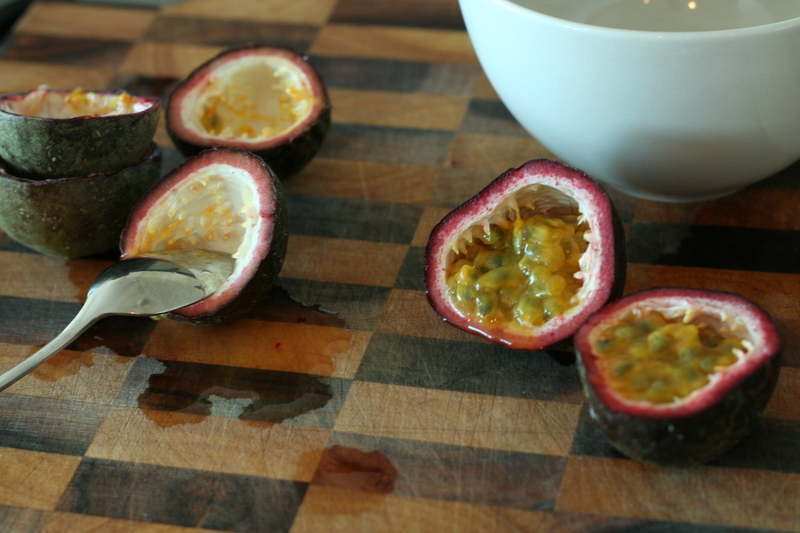 Combine the mixture with the icing sugar in a large bowl and add the passionfruit juice. Stir to combine. To fill the lamingtons pour some of the mixture into a piping bag fitted with a long tip. Poke the tip into the sides of the lamingtons and squeeze gently allowing the mix to fill the inside. 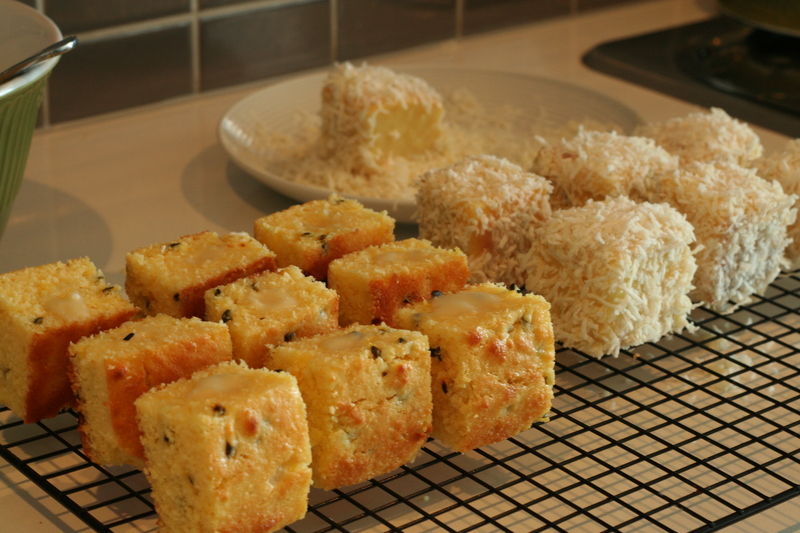 Stand on a tray and refrigerate for 20 minutes to make the lamingtons easier to dip. While waiting to cool allow the white chocolate mixture to sit at room temperature to thicken. To dip the lamingtons use two forks and gently lower in to the chocolate. Tap the excess off on the side of the bowl. Place into coconut and coat all sides. When coated allow to sit in the fridge for 30 minutes to set. What a lovely way to celebrate Father’s day! these look really beautiful! I love the combination of white chocolate and passionfruit! What a sweet sentiment for your father. I love your photos! I’m imagining how good these taste with a nice cup of tea. I didn’t realize that Father’s Day was celebrated this time of year in Australia (it’s in June here in Canada). 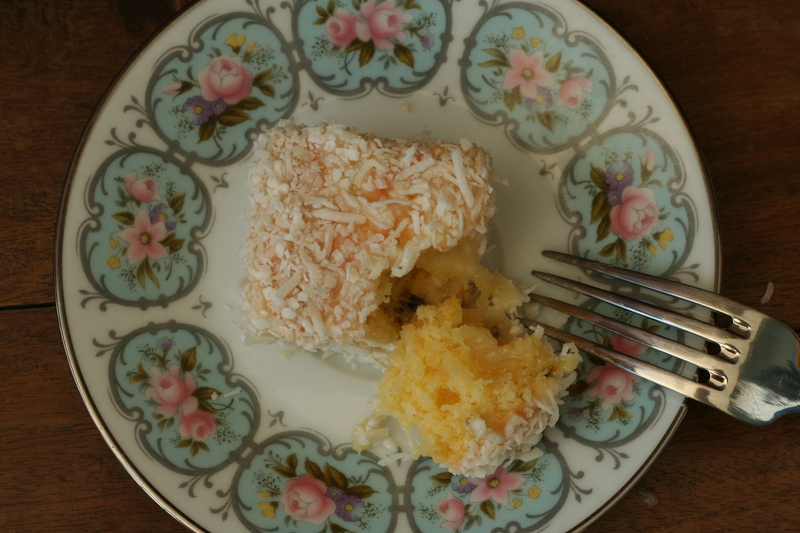 I had lamingtons when I was in Australia, and your photos bring back happy memories. Lovely!